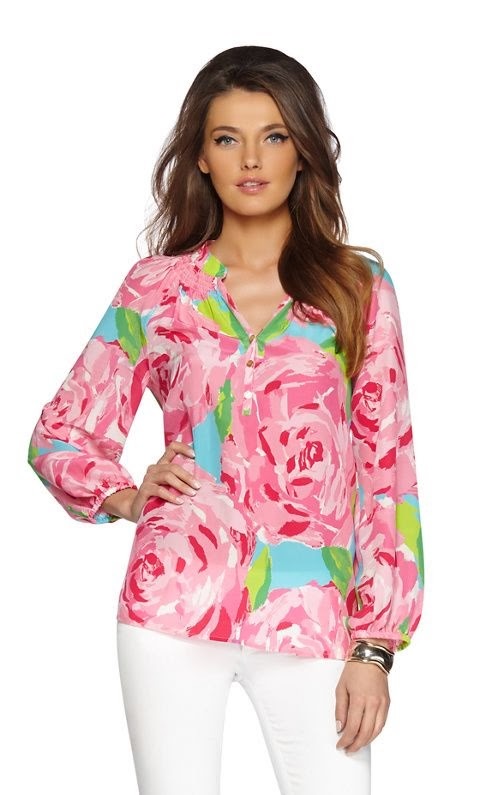 I have loved Lilly Pulitzer since I was a tiny tot growing up in South Florida. I mean, Lilly Pulitzer prints, Jimmy Buffet tunes, sunshine and Cuban food are in your blood when you are a native (or nearly) Floridian. It's not negotiable, really! But I don't insist on buying every last piece of Lilly. Especially years when I am less than in love with the prints and cuts (and let's be honest...there have been too many of those years recently). I pick and chose the pieces I love the most. The good thing about Lilly Pulitzer is that it's timeless. Vintage looks just as great as brand new. It's always in style in a preppy wardrobe. I've not been on the Elsa Top bandwagon though. They're cute but none of the prints have ever really screamed drop what you're doing and bring me home right this minute because you can't go on living one more day without me! Enter one of my favorite prints ever. Ever ever ever. Top three for sure. Maybe tie for #1, to be honest. Welcome to the world, and hopefully my closet this month, sweet Elsa Top in Hotty Pink First Impression. It really is love at first sight. I love you, I love you, I love you! I could not agree with you more! The best print ever!!! It Snowed And My Phone Is Monogrammed.